Telstra CEO Andy Penn proudly holding the new book of artworks from the Telstra Collection at MAGNT. Tony Albert's Big Telstra winner is in the background. Telstra is celebrating its 25-year association with National Aboriginal & Torres Strait Islander Art Awards (the NATSIAAs) by bringing the event out of Darwin with a series of installations of Aboriginal art in southern cities. It's the first time that anything like this has happened since the 25th Awards in 2008 when a national tour of art occurred. This time, it's happening on the streets in Perth, Melbourne, Brisbane and Sydney – with the Perth show kicking off today in the Perth Cultural Centre precinct. After that, openings are staggered through July, leading up to the Awards themselves at the Museum & Art Gallery of the NT in Darwin on August 5th – attended, as he does regularly, by Telstra CEO, Andy Penn. It's his discretionary budget that pays for quite a bit of visual art support, not only at MAGNT in Darwin but at the MCA and the NGV as well. Telstra has a 32-year link with the Australian Ballet too. And why not, when Penn can point out that “there are 7 million people in Australia attending arts events each year, more than the NRL and AFL put together!”. As I've written before in relation to the coffee-table book that Telstra produced recently promoting the 123+ work Telstra Collection of selected NATSIAA entries, the Telstra NATSIAA relationship has been good for 25 years (with the occasional wobble) because of naming rights and the symbiosis of Telstra's role as the national carrier of telecommunications, with especial responsibilities in the remoter parts of the country. 'Connection' is the buzz-word. As the installation project's curator, Rhoda Roberts – also Head of Indigenous Programming at Sydney Opera House - says, “At its heart, Indigenous art is about storytelling and bringing people together, and this project is about taking art beyond the gallery walls to locations where more people can enjoy it and be inspired by it. These installations will see Indigenous art out in the open, taking it back to its roots,” said Ms Roberts. The artists selected to exhibit their work at these installations include Michael Nelson Tjakamarra, winner of the first National Aboriginal Art Award (as it was then called) in 1984, who is still working with the Papunya Tjupi Art Centre, Brook Andrew, a Melbourne-based artist who produces visually striking mixed media work, Laurie Nilsen from Brisbane, who depicts his cultural and political concerns through barbed wire sculptures, and various Yolgnu artists from Arnhemland who create Larrakitj, painted burial poles. The ten male and female artists from Buku-Larrnggay Mulka Art Centre include such masters as Djambawa Marawili and Galuma Maymaru. Laurie Nilsen's emus will trot through the streets of Perth 28-30 June, the lovely Larrakitj will be in the great outdoors of Brisbane's Queen Street Mall (7-9 July), Brook Andrew's blown-up Wiradjuri balloons - The Weight of History, The Mark of Time (2015), seen last year in Sydney's Barangaroo, will feature at Southern Cross railway station in Melbourne (13 – 15 July), and Michael Nelson's artworks on Desert-discarded car doors can be found in Martin Place, Sydney (19-21 July). Each of the installations will be opened with an official Welcome to Country Ceremony and a performance by a different Aboriginal group. And then there's a trip to the NATSIAAs to be won! The public can vote for their favourite artwork selected from the 25-year history of the Telstra NATSIAAs to take two people to the 33rd NATSIAAs opening ceremony at the Museum and Art Gallery of the Northern Territory in Darwin (August 5 – 8), plus a Territory experience thanks to NT Tourism. To enter visit one of the installations, or go online to the website below. There were some thoughts that Telstra CEO Andy Penn's personal enthusiasm for Indigenous art as a sponsor and a collector might result in some direct interventions in the way the National Awards are run. But, apart from insisting that he couldn't imagine any change to the current ceremony that opens the Awards at its glorious, Arafura-Sea side setting outside the current Museum, rather than moving into town when MAGNT's newly acquired Chan Building becomes the Darwin Art Museum, Penn denied any interest in changing the somewhat inconsistent way in which the Awards are judged. “We're better at supporting the event – to a not insignificant financial extent – than we would be in judging them”, he determined. 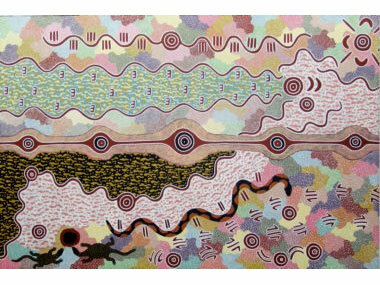 A classic 1997 work from Michael Nelson Jakamarra, 'Nine Dreamings'. His car door paintings will be seen in Sydney. 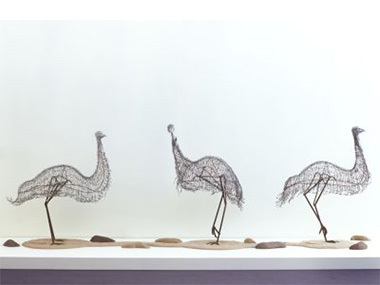 Laurie Nilsen's quirky emus, made from the barbed wire that limited their freedom of movement - and that of Aborigines - across Country.